We had site 94, full hook up. Everything worked fine. 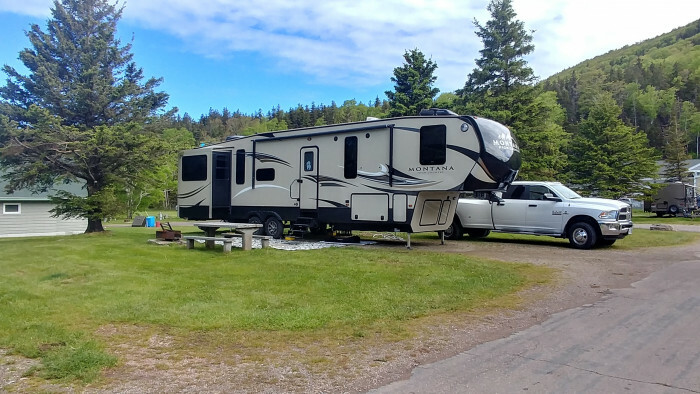 Not much privacy and little shade, but we have a 40 ft. fifth wheel and we prefer big, open sites that are easy to navigate over trees and obstacles. Very slow WIFI and almost no cell signal from our site. 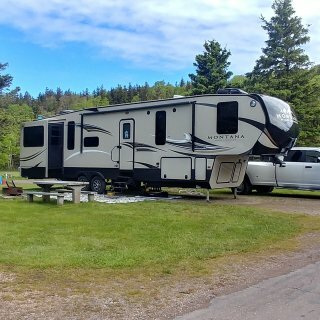 We camped at Cheticamp Campground (Parks Canada) in a Fifth Wheel. 2 hiking trails started right from the campground. "Salmon Pools" is easy and quite pretty running alongside the river. "Acadian Trail" is more difficult...about 3-4 hours, but WORTH THE EFFORT!! Take water, snacks and bug spray. The views from the top are unbelievable. We loved this campground. 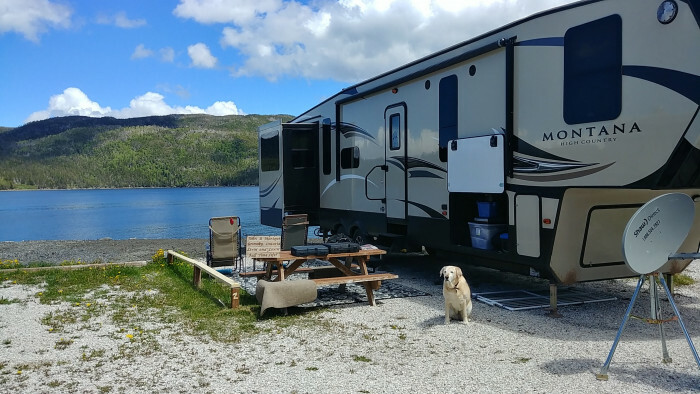 Fantastic location for exploring Gros Morne trails. Very friendly and helpful host. Clean, hot showers. Clean bathrooms. Water and 30 amp electric worked fine. Stunning view from our trailer. Site quite long, easy to back into. This is mostly a gravel lot with some grassy bits, but who cares with that view!! We camped at Water's Edge RV Park in a Fifth Wheel. 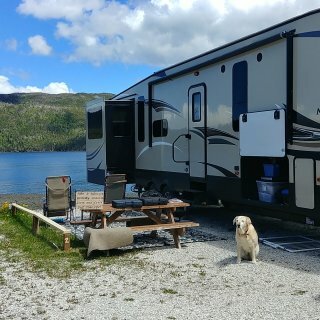 6 Gros Morne hiking trails within 15 min. drive. Town of Woody Point 5 min. drive with grocery, restaurants, shopping and liquor store. Kayak launch at Lomond River and Trout River....great paddling!! The pull through sites have large trees scattered on them, which make pulling in a little tricky. This campground is right on HWY. 26, and traffic noise is irritating. Entrance area before the gate is very small, and poorly designed. You must stop before the gate and register at the office, and there is only room for a few cars before traffic backs up onto the highway. Yikes. Showers are ok. A little dirty and cracking in places. I would not camp here again. 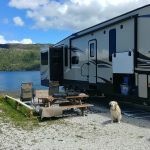 We camped at Craigleith Provincial Park in a Fifth Wheel. Great park. Sites are mostly large and private. The post with our site # on it was kind of hidden/camouflaged, and we hit it with the side of our trailer. Put a hole in our trailer door. Sooo, drive very slow and watch for posts/obstacles. Roads are very twisty and narrow. Premium sites at the back are very nice. Try to get those if you have a big rig. Great location for exploring Tobermory and area. Note; water tap at dump station didn't work. Hope they fix it. We will definitely camp here again. We camped at Lands End Park in a Fifth Wheel. Go to Flowerpot Island. Try to spend a few hours there. So pretty. Jet boat ride lots of fun. Glass bottom boat also cool. Go to "The Grotto" at Bruce Peninsula Park. Great hike. We took the difficult trail, (very rocky in some places) but there is an easier trail available. Very large park. Sites are big and shaded. We had a little trouble backing into our site; not a lot of room to swing front of truck around, as road is very narrow with lots of trees and bushes. We would pick a pull through site next time. They are large and very private, (all sites are really private). Showers are fantastic! Beach area is nice. Rocky beach next to our campsite; can't swim there. But sunsets are amazing! Nice bike path/walking trail around the park. We camped at Inverhuron Provincial Park in a Fifth Wheel. Kincardine is a very pretty town 10 min. down the road. We stayed here from June 6 to 13, 2016. Our site was on the far side of the quarry, full HU. Paved site and patio area. Lots of grass. Beautiful view, right on water edge. But, VERY WINDY. Could not open the awning most of the time. Bonus, though: We had WIFI, although not all the time. Watched NETFLIX some nights! This is a good resort if you have kids. LOTS for them to do. If you're looking for a quiet, peaceful campground, this is not for you. They used to allow cars on the beach, but not anymore, which was disappointing for us. We camped at Sherkston Shores in a Fifth Wheel.